The ranch is located two miles east of St. Johns, Arizona and directly along County Road 6040 (Salt Lake Road) for approximately nine miles stretching east. The headquarters is situated a quarter mile north of the county road and ten miles east of St. Johns. 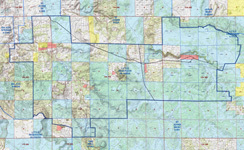 Access is provided by the county road, numerous River Springs Ranch roads and private ranch roads. The ranch consists of a mixture of private, state, blm and open range grazing acreage. The open range property includes surface grazing rights within the River Springs Ranch area outside of St. Johns. 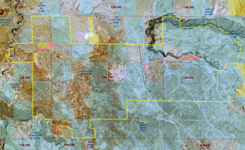 The state and blm land is somewhat intermixed with the surface grazing and includes a large block of contiguous state land on the eastern portion of the ranch. The ranch headquarters includes a 2001 Palm Harbor 28’x60’ mobile home in good condition, a 40’x40’ large metal shop building and extensive set of working corrals all located on a 160 acre block of deeded land. A second home is located directly adjacent to the County road approximately two miles west of the headquarters and contains a 1998 Palm Harbor, 26’x68’ model home in good condition. Both building sites include a residential well which also provides livestock water. Public utility electrical service is available and in use at both building sites. Land line electrical service is available to portions of the ranch including to the headquarters site and second building site. Telephone service is cellular, water is provided by private well, septic is used for sewer service and propane is used for heating. Livestock water is provided by five wells, (one solar pump, one windmill and three electric submersible pumps). Two of the wells also provide water to over four miles of pipeline equipped with four large steel rim storage tanks and six drinkers. Additional water is provided by live water in the Little Colorado River on the western edge of the ranch, one large dirt tank and one live spring. Please click here to download (about 11mb) a printable brochure in Adobe Acrobat format. If you get frustrated trying to make this work on your computer, don't hesitate to ask us to mail you a printed and bound brochure instead.